Back when I first created the world of the Named Lands, I was operating on sketches…really rough sketches. Remember, the series started out as a short story that stretched into what I thought would be four or maybe (gasp) a novella. Then it turned into a five volume series. I didn’t have (or even need) much by way of maps in the beginning. 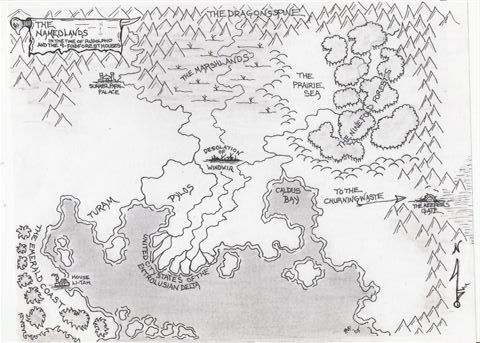 But when Tor picked up the series, they wanted a map and I knew it would be something readers appreciated. So I went to my pal Robert (aka Renard) and asked him if he would build a prettier map out of my crude sketch. Robert had been the person to introduce me to sword and sorcery fiction and to Dungeons and Dragons (and through TSR, a bunch of other RPGs). He was my first DM and the first person I ever DMed. So it was quite cool to have his hand on this world. He was my first mentor in world-building back when we were twelve. Of course, as the series grew and I took us into different parts of that world, we needed more maps. Another crude sketch gave us an expanded view for Canticle. I’m hoping, before I finish Hymn, to provide more sketches since the world has expanded even more, especially in Requiem. I’ll try to post these other maps here and maybe even create a permanent home for them on the website. But for now, here’s what Robert did with that first map. This became the basis for the maps that both Tor and Bragelonne (my French publisher) included in Lamentation.